Why use Tungsten Carbide instead of other materials? Tungsten carbide (WC) is an inorganic chemical compound containing equal parts of tungsten and carbon atoms. Tungsten carbide is often simply called carbide. In its most basic form it is a fine grey powder, but it can be pressed and formed into shapes for use in industrial machinery, tools, abrasives, as well as jewellery. Tungsten carbide is approximately three times more rigidity than steel, with a Young's modulus of approximately 550 GPa, and is much denser than steel or titanium. It is comparable with corundum (α-Al2O3 or sapphire) in hardness and can only be polished and finished with abrasives of superior hardness such as silicon carbide, cubic boron nitride and diamond amongst others, in the form of powder, wheels and compounds. Tungsten Carbide is an incredibly versatile material that comes in numerous different types to give varying properties. These varying characteristics are the main reason for its popularity in a range of applications and industries. In typical conditions, when uncombined, Tungsten is a steel-gray coloured metal, Tungsten is only found naturally on Earth when combined in chemical compounds. It was discovered in 1781. The free element is known for its tough physical properties, particularly the fact that it has the highest melting point of non-alloyed metals and the second highest of all the elements a behind carbon. Tungsten Carbide (WC) is an inorganic chemical compound formed from equal parts of Tungsten and Carbon. It is formed by reacting Carbon and Tungsten at temperatures of between 1400 to 2000 degrees C (2552 to 3632 degrees Fahrenheit). These high temperatures make it ideal to be for mills and cutting tools for industrial use, which are able to required heavy use and high temperatures. Tungsten Carbide starts off as a fine gray powder, in this form its hard wearing properties makes for an excellent abrasive, or this powder can be pressed and formed into a desired shape, for example tools, jewelry and machinery. The rare and extraordinary physical properties retained by Tungsten Carbide makes it useful for a variety of applications. It is enormously strong and wear-resistant, so much so that there are only a scarce number of materials on earth that can cut or scratch Tungsten Carbide, with industrial diamond abrasives being one. It is important to understand that Tungsten Carbide is available in different grades, which properties vary depending on use. There are many different grades of Carbide, which vary on just a few parameters: grain size, hardness, and the degree to which a binder is used. How many grades of carbide are available? There are over a dozen different grades of Tungsten Carbide. When evaluating or finding equivalents of Tungsten Carbide grades the important criteria is to specify two of three factors; binder content, hardness or grain size. When choosing between the numerous distinct grades, it is important to understand what properties are required for the application. For example grade CD-630 is extremely hard wearing, but only able to cope with low impact, so it is perfect blades and seal rings. Whereas CD-70 is designed to endure high impact environments and is therefore perfect for manufacturing header dies. 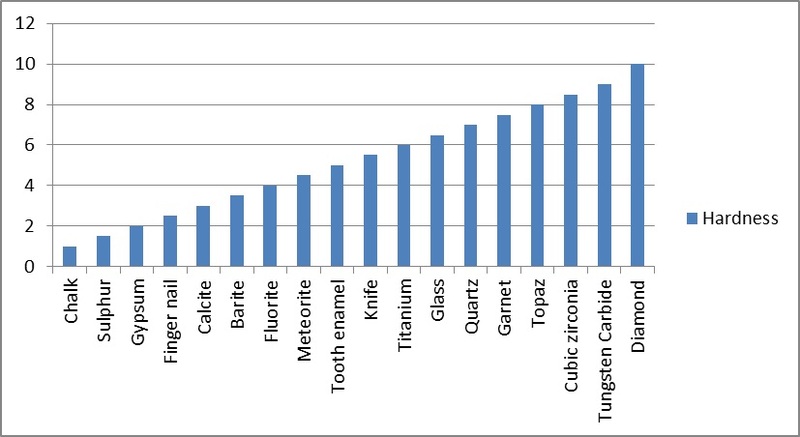 The Tungsten Carbide properties chart, on our website, shows basic data for each grade manufactured. All specifications are designed and engineered for a purpose and rigid controls are kept throughout production processes to ensure adherence to grade engineering. Tungsten Carbide - What impact does the binder have? Traditional Tungsten Carbides, with Cobalt binder, have limited corrosion resistance, making them unsuitable for applications in which the wear parts are functioning under both severe abrasive and corrosive conditions. Why is the grain size important? The story of Tungsten Carbide (WC) powder metallurgy, and particularly that of the hardmetal industry, is depicted by a progressively widening range of available grain sizes; whilst simultaneously narrowing the grain size distribution for each grade of WC powder. The most significant motivation for this broadening of the range of available WC grades is the properties of WC hard metals such as hardness, strength, toughness, thermal conductivity and abrasion resistance can be extensively varied by grain size. At the start of the hardmetal industry the range of available WC grain sizes ranged from 2.0 to 5.0 microns, the grain sizes of WC powders now used in hard metals range from 0.5 microns to 50 microns, or even 150 microns for some very special applications. The majority of grades we machine are made with standard size grains varying between 1 and 3 microns in size. Using larger grains of 2 - 6 microns will greatly increase the strength and toughness of the material because the larger grains interlock better. The tradeoff is that larger grain materials do not offer as much resistance to wear as finer grain sized materials. Sub-micron materials that vary between 0.4 and 1.0 micron grain size are harder than standard grain materials with the same cobalt content. The sub-micron grains are much more uniform in size and hence give improved hardness as well as increased carbide strength. However, as specs show the transverse rupture strength is perhaps 20% improved on 15% sub micron compared to 15% fine grain material but this can give a false impression as sub-micron carbide is not as resistant to impact and may chip more easily. There are currently four carbide grades offered for die and wear part function. The first is the typical grade with a 1.5 micron to 17 micron grain size of tungsten carbide. The typical carbide grade is chosen where light, medium, or heavy shock loads are faced. It is commonly used in settings such as airless paint spray nozzles, valve seats, pump seals, cold heading fastener dies, cold impact extrusion punches, wire drawing and seaming rolls. A submicron carbide is also selected where light, medium, or heavy shock loads occur, but when a fine, keen cutting edge is also required. If the size of the grain is too large and the percentage of binder is too higher, then the carbide will deform under pressure. One of the major advantages of carbide is its proficiency to cope under pressure or compressive force. If it is too soft it loses that ability. Neither binder percentage or grain size alone determines how a grade will perform. How much strength does tungsten carbide offer? The transverse rupture strength (TRS) of Tungsten Carbide with Cobalt variations is sometimes regarded as an indication of “toughness” which increases as hardness decreases. A recent study was conducted using a controlled group of Tungsten Carbide with Cobalt samples with consistent TRS values. It demonstrated a different relationship between the TRS and hardness of Tungsten Carbide with Cobalt compounds. “It was shown that TRS is closely related to the hardness and facture toughness. Within a hardness range of 800 < Hv < 1500 kg/mm2, TRS appears to first increase and then decrease as the hardness increases. It reaches a peak value at Hv ≈ 1300 kg/mm2.” Zhigang Zak Fang 2004. Compressive strength is measured by compressing a right cylinder test piece between two tungsten carbide blocks held in line by an outer sleeve assembly. The CS of Tungsten Carbide is higher than for virtually all metals and alloys. This high compressive strength makes it possible to compress carbon at one million P.S.I. from man-made diamonds.